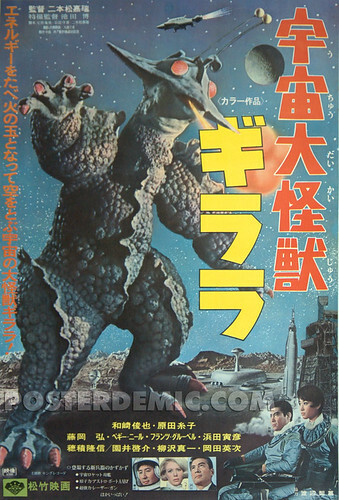 Uchu daikaiju Girara / X from Outer Space Japanese B2 movie poster, originally uploaded by japanese-movie-posters. This is a very rare poster. Girara is just a very tough poster… I have only seen two of these in the last eight years, perhaps three. And only one time have I seen the two panel, and I bought and sold it to a collector in Europe. This one is mounted on linen courtesy of Vintage Movie Art in Vancouver B.C. This Girara B2 Japanese movie poster is available for $575 from posterdemic.com. Email us for details.